Today, I’ve teamed up with Elle from Living in Color Style to bring you, “Two Color Combos to Try This Summer. I thought we would both nail this category since both of our blogs have color in the name. Plus, it’s always been being surprised by what the other blogger comes up with! I paired chartreuse, mint and touches of brown. 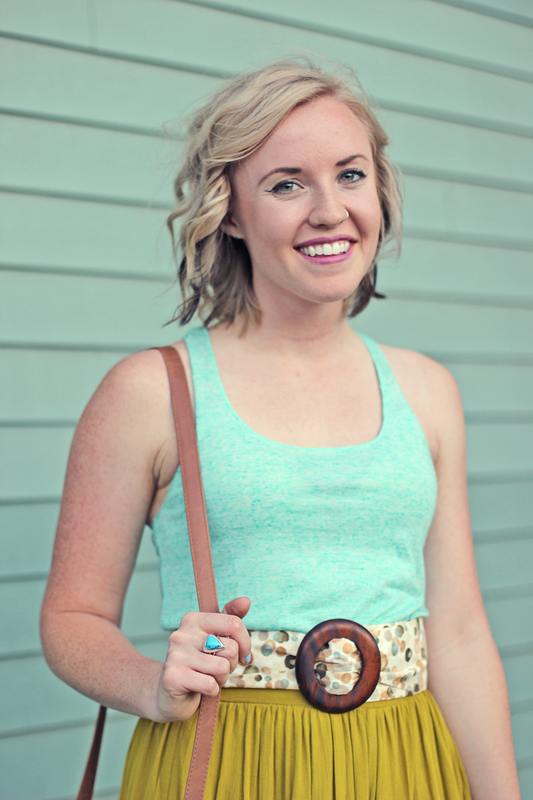 I often forget about this pretty wooden belt I got from Anthropologie on ultra sale a while back. It seemed like the right piece to marry the tank and skirt together. Elle chose to mix mint, fuchsia and orange together. Don’t you just want to steal this dress?! 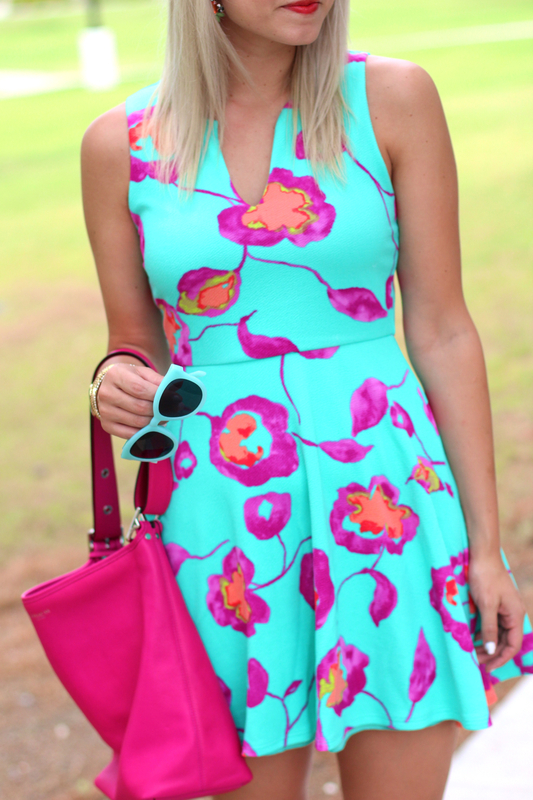 It’s bright colors and unique water color florals make it a great look for Summer! And guys you don’t have to pretend like you’ve never seen this skirt around these parts. It’s been featured here and here! These are the cutest light blue sunnies! If you’re looking for a quick and simple way to add some fun color to your look this summer, take note from Elle and add a pop of color to your sunglasses! 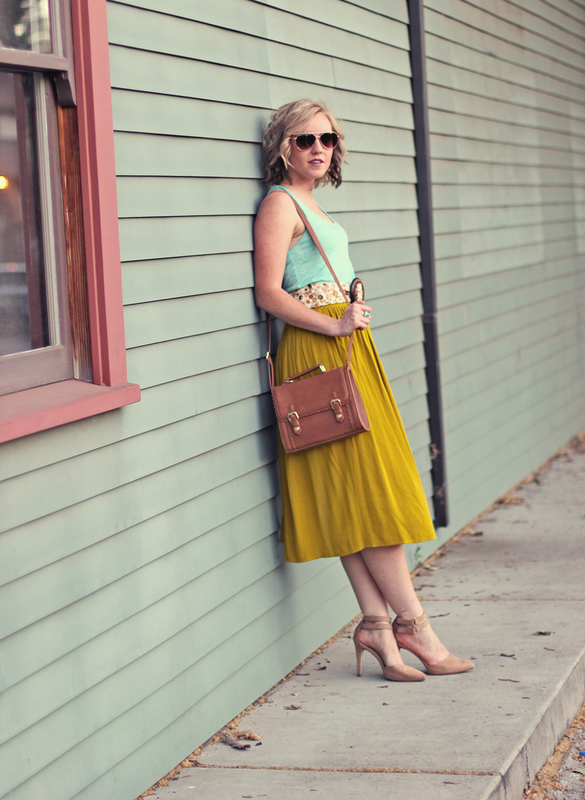 This skirt was a major deal at Topshop in Nordstrom. The top clasp was broken so it was like $20 regularly $70. Score! I hope you enjoyed this collab! If you have an idea for the next one let me know! I am open to new themes! i love the length of your yellow skirt! and her blog is so cute! Loving both of your looks. Your color combo is fab!! I love this collab!! You two couldn’t have taken a more different approach to this concept, but I love both of your looks! Both of the looks mix color perfectly! Love this idea & I would love to collar with you on it sometime! The blue and purple dress is to die for! love it!